Muni's budget is allegedly bleeding so badly that more cuts and changes in policies would be necessary; and it could come as soon as May. SFMTA Board will decide if they want to renew SFMTA Chief Nathaniel Ford's contract for another four years. This is brand new news straight from the "City Insider" of the SFgate. These two items are going to cause some major problems. 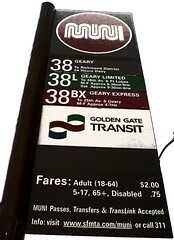 The public is already angry at Muni for the pass hikes, service cuts, and fare hikes. Also, nobody likes Nathaniel Ford for having such an enormous salary and turning our transit agency into the worst piece of trash in the country. The SFMTA Board represents the people of the City and County of San Francisco, DO YOUR JOB AND FIRE NAT FORD IMMEDIATELY. If you are pissed-off at everything about SFMTA/Muni, tell them! Go to the meeting tomorrow and note your planned attendance on this Facebook page. Sign an online petition to show your anger. Pro Wrestling Back at the Cow Palace?